Minister in the Prime Minister’s Department Tan Sri Nor Mohamed Yakcop (left) and Sunway Group founder and chairman Tan Sri Dr Jeffrey Cheah at the launch of Sunway REIT’s prospectus yesterday. PETALING JAYA: Sunway City Bhd (SunCity) and Sunway REIT Management Sdn Bhd have launched the initial public offering (IPO) of 1.65 billion units in Sunway Real Estate Investment Trust (Sunway REIT). Sunway REIT, which has an approved fund size of 2.78 billion units, will become Malaysia’s largest listed REIT when it lists on the Main Market of Bursa Malaysia in July. 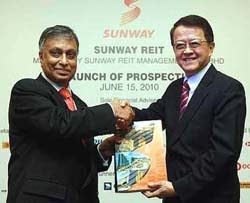 Sunway REIT Management is the manager for Sunway REIT. Eight properties, with an appraised value of RM3.7bil, would be injected into the REIT. They are Sunway Pyramid Shopping Mall, Sunway Carnival Shopping Mall, SunCity Ipoh Hypermarket, Sunway Resort Hotel and Spa, Pyramid Tower Hotel, Sunway Hotel Seberang Jaya and office properties. Sunway REIT Management chief executive officer Datuk Jeffrey Ng said the company was committed to actively providing value-added services to the properties. “Four of the assets are in Bandar Sunway, which has over the years proven its growth potential as a landmark tourist destination,” he said. He said there was a planned enhancement of several existing assets, and leasing of recently completed space, adding that the assets being injected into the REIT were assets in locations that had proven track records for growth. Sunway REIT’s IPO comprises an institutional and selected investors portion of 1.52 billion units and a retail portion of 134 million units. The final retail price per offer unit would be the lower of 97 sen, or 97% of the institutional offer price, to be determined by way of bookbuilding. Four cornerstone investors – the Employees Provident Fund, Permodalan Nasional Bhd, Government of Singapore Investment Corp and Great Eastern Life Assurance (M) Bhd – have secured 376 million units, or about 22.7% of the offer units. An analyst with a local brokerage said the listing of Sunway REIT next month would be a milestone for Malaysian REITs (M-REITs) not only because of its large fund size, but also because it had attracted several cornerstone investors. “Sunway REIT will be on the radar of the ‘big boys’ and this can only be good for the smaller REITs as well,” he said. The analyst also said Sunway REIT could bolster the equity market and make it more attractive to foreign institutional players. According to the analyst, Sunway REIT’s dividend yield was about 6.7% (based on forecast dividend per unit or DPU of 6.7 sen), which was below the average 8.5% for other REITs. He said the REIT’s IPO was at a premium to other M-REITs. “But taking account of the size of the trust and its potential, we believe Sunway REIT has its merits,” he said. A REIT adviser said that while Sunway REIT had its “attractiveness”, there could be some investors who preferred to invest in pure-play REITs that were focused on specific asset classes such as retail, office space and warehouse. “Sunway REIT is a fairly unique trust because it’s a mixed REIT that has retail and hospitality elements,” he said. The REIT adviser said if the different asset classes were integrated in a synergistic manner and managed well, Sunway REIT might actually offer a favourable return to investors over the longer term. “This is left to be seen,” he said. With about 1.6 billion units up for subscription by retail and institutional investors, the REIT is also set to be the most liquid of REITs available in the market. Malaysia's biggest property trust, the Sunway real estate investment trust (REIT), has set a target to double its size to RM7.4 billion in the next five to seven years. It will focus its investments on shopping malls, hotels and offices. "Sunway REIT is very much a township REIT, with the best assets of Bandar Sunway. 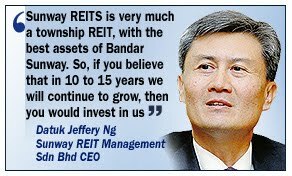 So, if you believe that in 10 to 15 years we will continue to grow, then you would invest in us," Sunway REIT Management Sdn Bhd chief executive officer Datuk Jeffery Ng said. The Sunway REIT is made up of eight of Sunway City Bhd's (SunCity) properties in the retail and hospitality space, located in Penang, Perak, Selangor and Kuala Lumpur, valued at RM3.7 billion. This includes the popular Sunway Pyramid Shopping Mall and its newest purchase, Sunway Tower, an office building in central Kuala Lumpur. It has an approved fund size of 2.78 billion units. With about 1.6 billion units up for subscription by retail and institutional investors, the REIT is also set to be the most liquid of REITs currently available in the market. About 8 per cent of the initial public offer units will be offered to retail investors, while the rest will be offered to Malaysian and foreign institutional investors. About 35-38 per cent of total approved fund size will be held by SunCity. "Investors are not looking for the lowest tax scheme, rather they are looking for growth and liquidity. Generally, Malaysian REITS have been illiquid, so the Sunway REIT will interest a lot of investors," RHB Investment Bank Bhd managing director Chay Wei Liong told reporters after the launch of the REIT's prospectus in Petaling Jaya, Selangor, yesterday. Malaysia imposes a withholding tax of 10 per cent on individual investors for income made from REITs. Singapore, a popular destination for REIT listings, does not have such a tax. On whether the recent announcement by CapitaMalls Asia to list its REIT on Bursa Malaysia would dampen interest in Sunway REIT, Chay said there was enough money to go around. Ng did not discount the possibility of secondary listing in Singapore, saying the board will have to decide on that. On possible plans to inject SunCity's overseas properties into the REIT, Ng said it will focus on Malaysia for the short and medium term. "In the long term, should and when the opportunity arise we will consider it, and work hand in hand with our sponsor. It would be something that our board of directors would decide on," Ng said. IJM Land Bhd said its unit IJM Properties Sdn Bhd and Angkasa Gagah Sdn Bhd, a unit of IGB Corp Bhd, have scrapped a plan to build residential property in Setapak, Selangor. Both parties signed a deal for the project in October 2006. IJM did not say why they aborted it but said that it needed regulatory approval for the project.